Potatoe Puffs 2 cups Buttermilk 2 eggs 2 vegetable spoon mashed P- 3 heaping teaspoon of Baking powder 1 teaspoon soda Stir in enough flour to make a stiff batter and drop from spoon into boiling fat Eaten with syrup. 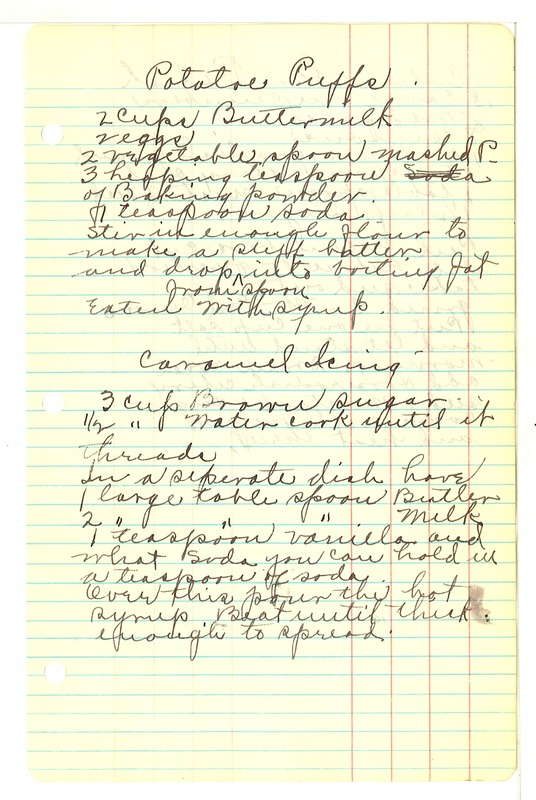 Caramel Icing 3 cups Brown sugar 1/2 " water cook until threads In a separate dish have 1 large table spoon Butter 2 " " " milk 1 teaspoon vanilla and what soda you can hold in a teaspoon of soda. Over this pour the hot syrup. Beat until thick enough to spread.